Last week of my 30’s | La Rosilla - Lifestyle and food. So it’s arrived , knew it would, didn’t want it too – WHY ? because I don’t feel ready, surely I’m not old enough to be 40 ;), my dream plan hasn’t come to fruition, that is of being in control of my life, living in perfect balance & harmony, or maybe I should have taken note of what I called it my ‘DREAM’ plan instead of my goal. I created a womens group ‘ Views from the hills‘ to share events, experience things together and give each other support, which is growing steadily…. Areas I need to work on, my OCD in bed making and cushion plumping , creating my ‘recipe’ book, sometimes saying no, oh yes and beating this financially challenging time in Spain – Survival of the fittest and all that – having a holiday, yes I might live in an idyllic place, with fresh air, blue skies, warm sunshine and cheap wine, but a holiday would be nice. 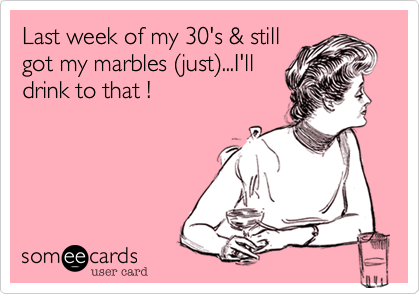 Well hey ho, I’m told 50 is the new 40, so that’ll give me another 10 years to work on my plan, but while I renew my goals or at least spend time thinking of them, I’ve got a party to plan – a big PARRTTYY , Mine 😉 so once again I digress. Ahhhhhh, very open & honest Lynsey. Here’s to the next 10 years & I’m sure your list then will have lots more achievements to add to this list. Take care and have a fantastic party – sorry we can’t be there. Here´s to the next ten years!